Rest with ease, with residential-style lodging in Sunnyvale, California in the heart of Silicon Valley. Work, relax or entertain in exquisitely decorated studio suites with 475 square feet of space, stylish décor and modern furnishings that give you the warm feeling of home. Our hotel's 73 spacious studio suites each feature a king-sized bed, separate living area, sofa sleeper, work desk, and kitchen with a refrigerator, microwave, coffee maker and dining ware. Many rooms have balconies or patios to enjoy the fresh air and sunshine. 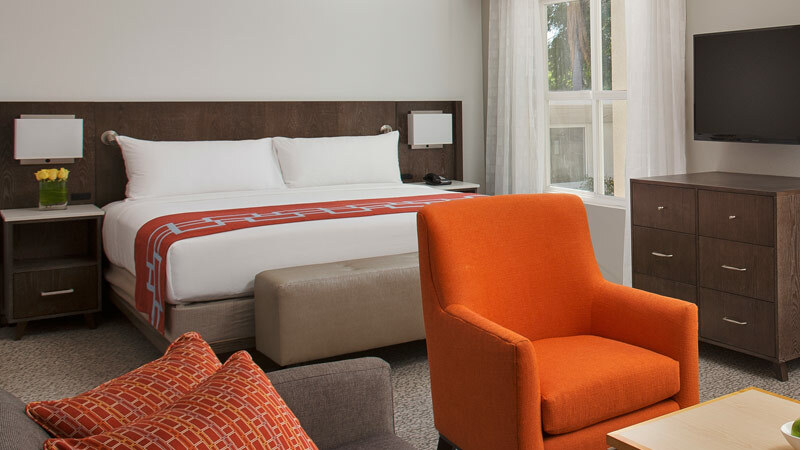 Designed for modern comfort and productivity, our Sunnyvale lodging is ideal for families, corporate travelers and extended stays in the San Francisco Bay Area. 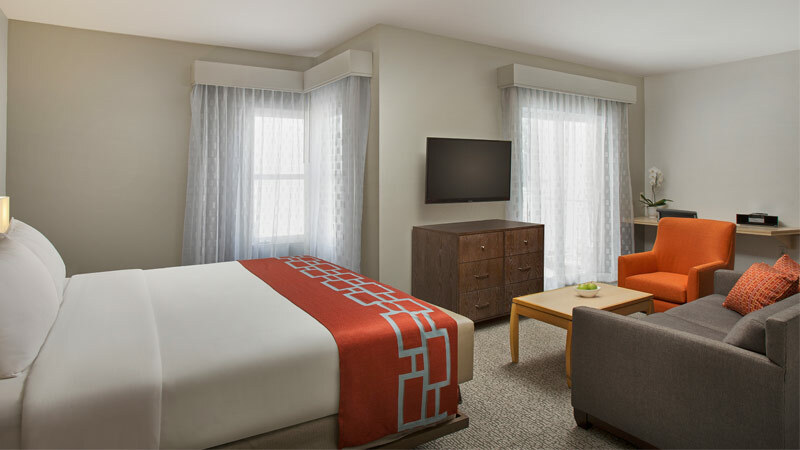 Our studio suites offer all the amenities to accommodate both short term and extended stay travelers. 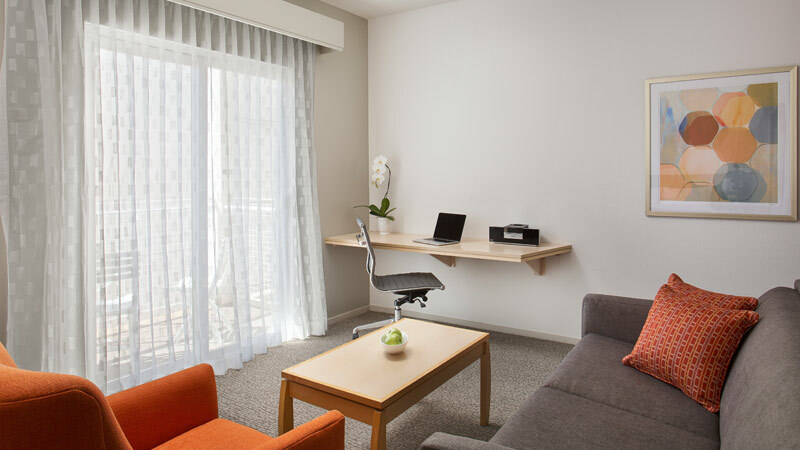 In addition to standard business and vacation amenities, our spacious suites include a kitchen, a comfortable king size bed, a large work desk, and a spacious living area. 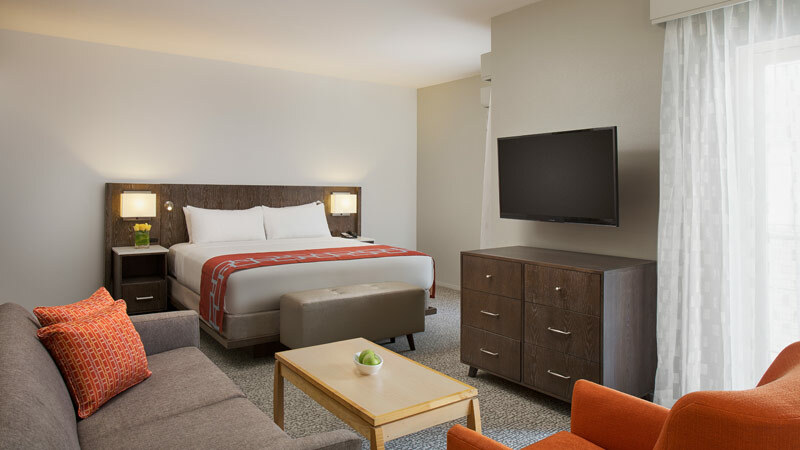 Book either a short term or extended stay in our spacious junior suites, and take advantage of welcoming perks like plush bathrobes, custom modern furnishings, complimentary Wi-Fi, and a large work desk. Each fully accessible king suite features a separate living area, kitchenette, and a work desk. This suite has a roll in shower and kitchen counters are wheel chair accessible. The room is equipped with visual fire alarm and door bell, TTY telephone and enlarged number alarm clock with bed shaker. Each fully accessible king suite feature a separate living area, kitchenette, and a work desk. The suite has a tub over shower with transfer seat and hand held shower. Kitchen counters are wheelchair accessible. The room is equipped with visual fire alarm and door bell, TTY telephone and enlarged number alarm clock with bed shaker.